The fall is my absolute favorite season of the year… the cool weather rolling in, comfy sweaters, soups and stews, apple picking, and all of the in-season produce that is running rampant through every supermarket. Some of my favorite seasonal foods available in the fall are Jerusalem Artichokes, Celery Root, Parsnips, Apples, Brussel Sprouts, and of course Butternut Squash. 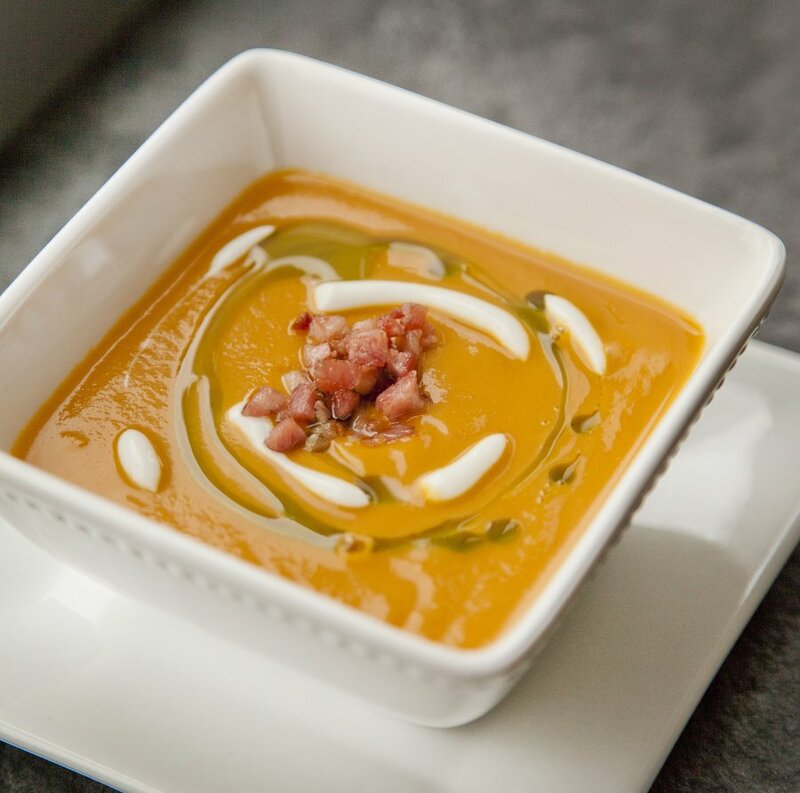 So for today’s cold, grey day in NYC, I made some Butternut Squash Soup topped with crispy Pancetta – pretty much the best combo of sweet and salty that a soup can have. 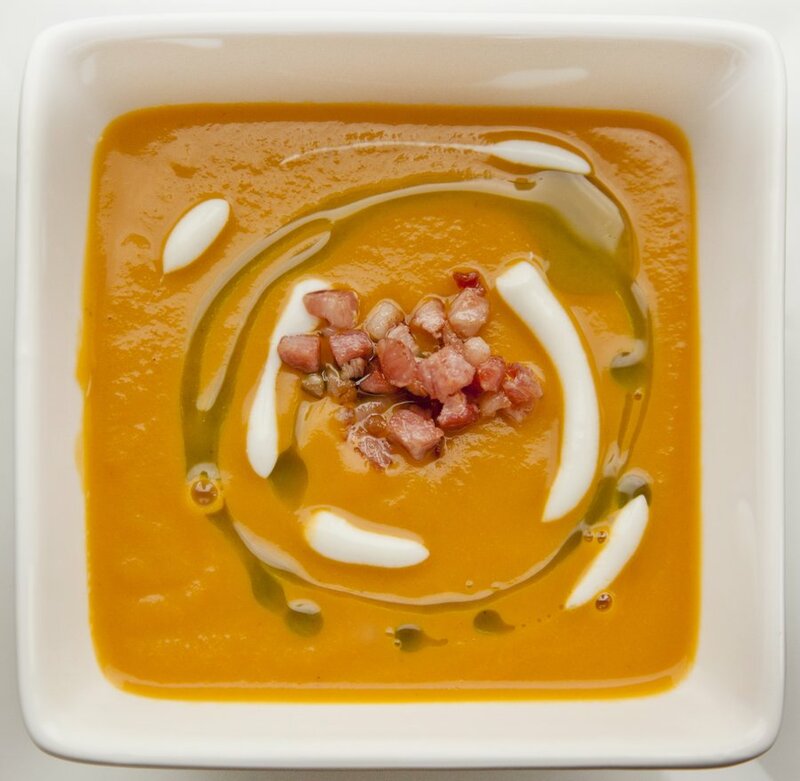 Of course, if you’re vegetarian, just leave the pancetta off and the soup itself is completely meat free! This recipe is also gluten free as well! But it is not flavor-free! One of my secrets to bringing out some warmth in terms of flavor in this soup is adding in some ground cumin. 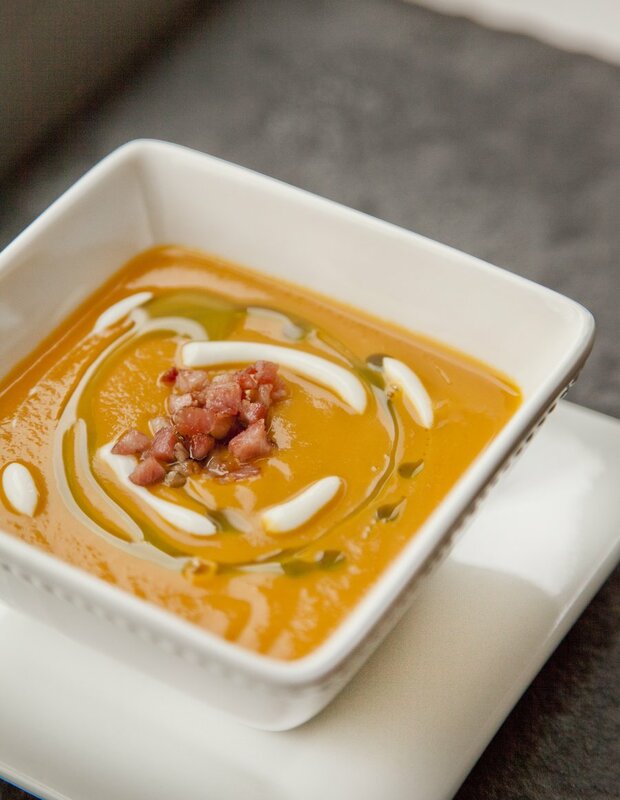 It just adds a little depth to the flavor and brings out the incredible taste of the butternut squash. 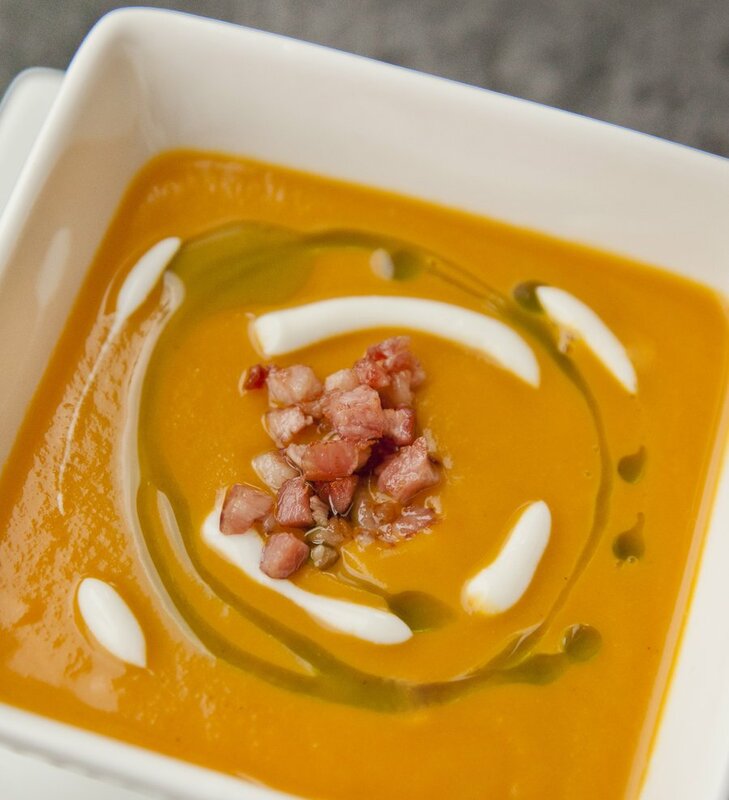 My soup (pictured) was not only garnished with Pancetta, but with Parsley Oil (my recipe is below) and a sour cream drizzle. To achieve this sour cream effect, invest in a small squeeze bottle (it may set you back all of 50 cents), add some sour cream into it and add in a little milk/heavy cream (just enough to slightly loosen up the texture of the sour cream). Shake the bottle and squeeze! This is a great effect for any soup – I also do it on my tacos as well to create a classy looking effect! 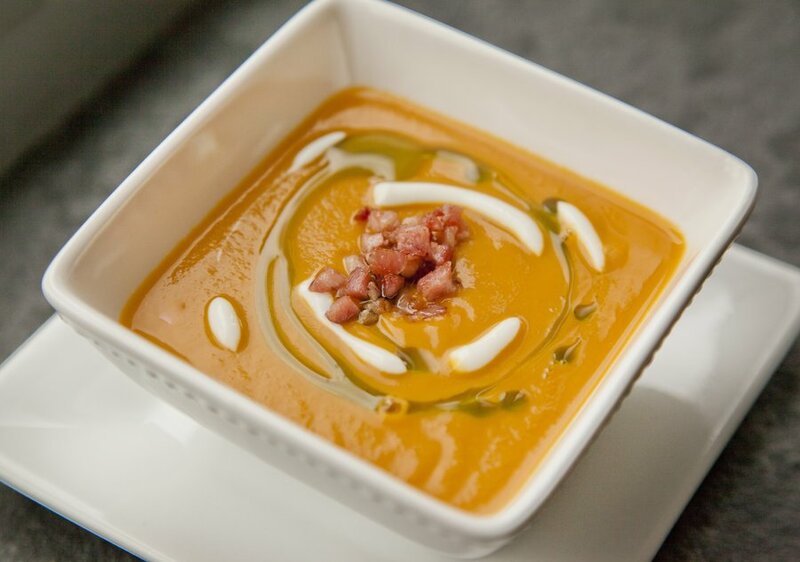 The perfect Fall Soup to enjoy on these cold days! Preheat your oven to 375 degrees. Place your cubed butternut squash in an oven safe baking dish. Drizzle generously with Olive Oil, salt and pepper, toss together. Cook in the oven for 45 minutes (shaking the baking sheet halfway through cooking). 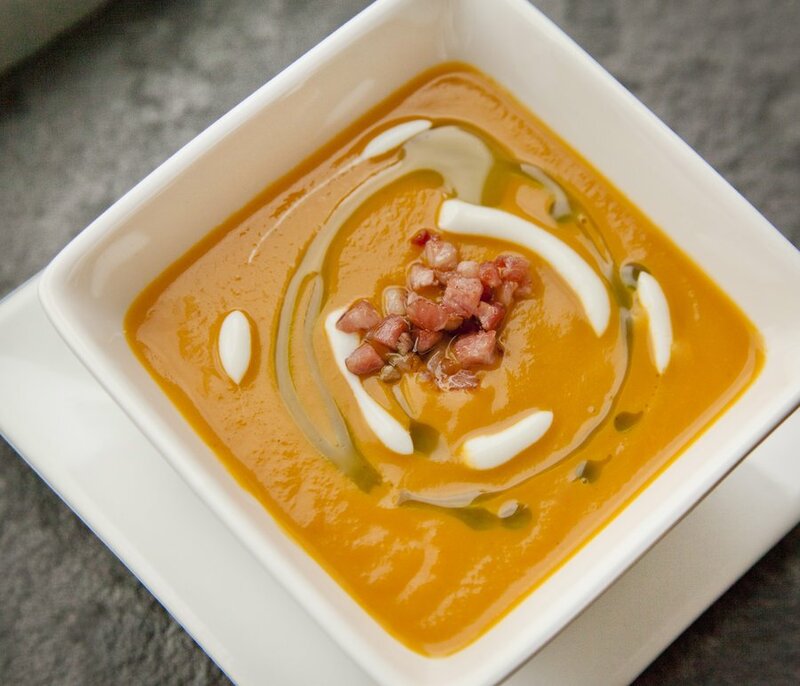 While the butternut squash is cooking, start on the base of your soup. In a medium sized pot, heat up 1 tablespoon of Olive Oil. Once hot, add in your onion, celery, garlic and cumin. Cook for 5 minutes over a medium high heat, stirring frequently so as not to burn. Add in your tomato paste and cook another 2 minutes stirring together. Add in the white wine, and scrape all the bits off the bottom of the pot with a wooden spoon. Cook about 2 more minutes. Now, add in your stock, tarragon, sage, and bay leaf to your pot. Bring to a boil, then reduce to a simmer. When your butternut squash is ready, add that into the pot as well. Cook for about 15 minutes over a medium heat. Remove the Tarragon, sage and bay leaf from the pot and discard. Pour the entire contents of the pot into a Vitamix (or other high speed blender). Add your heavy cream in and blend for 1 minute on the highest speed. Taste, season with salt - and blend again, another 20 seconds. Have a large bowl with a fine mesh sieve ready and pour the contents of the blender through the sieve into the bowl. Use a large ladle to get all the soup through the sieve (leaving behind any gritty bits that may remain in the sieve - discard what's left in the sieve). 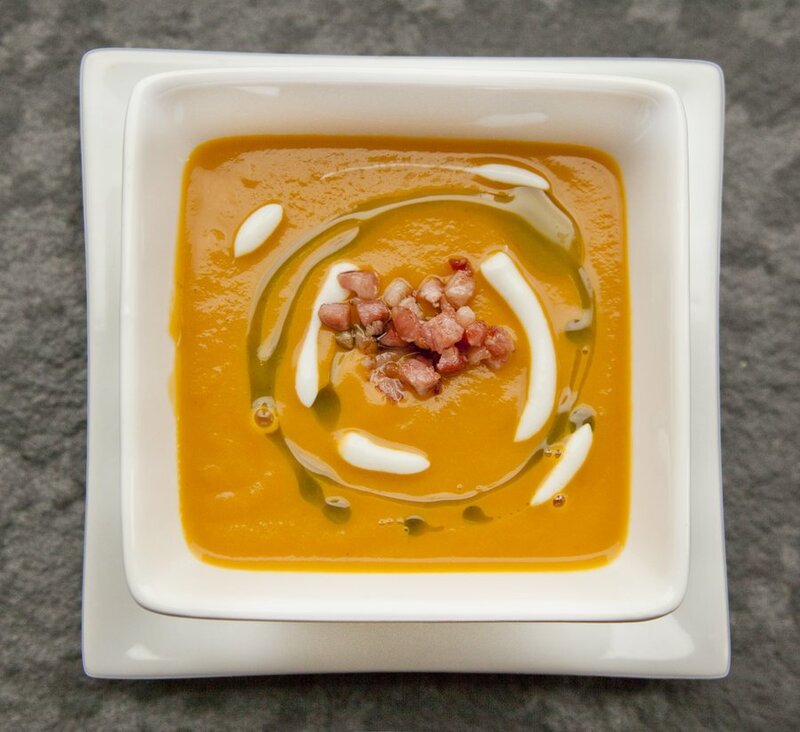 You can leave this soup like it is (which is vegetarian), or add finely diced cubes of pancetta to the top - Just saute the pancetta in a saute pan until golden brown and sprinkle them on top. I also garnished my soup with my Parsley Oil (recipe below) and some sour cream.